Through a nine-year collaboration, the women’s councils of two Mississippi universities have developed a bond that is proving beneficial for both organizations. In 2007, the Ole Miss Women’s Council for Philanthropy (OMWC) helped develop a similar council at Jackson State University. Ever since, the two have strengthened each other, building on their relationship for the benefit of students. Recently, the organizations gathered together on the University of Mississippi’s Oxford campus. At the recent meeting, council members from both universities shared best and promising practices, gained insight on the structure and implementation of their respective programs, and discussed the coordination of student scholarships. While each of the councils is unique, they share a common organizational structure and mission. Helmed by an accomplished cadre of female leaders and philanthropists, the councils provide students with scholarships for tuition and books as well as guidance and training in leadership skills, career development and personal growth. The scholars, who are mentored throughout college by sitting members of the councils, participate in leadership training, community service projects, cultural enrichment activities and alumni networking. By working together, the UM and JSU women’s councils are focusing on philanthropic giving opportunities for their respective institutions and students. The collaboration provides insight on how each council operates within its by-laws; how members participate on various committees to promote philanthropy; and how to enhance each council with new ideas and strategies for promoting philanthropic giving and activities. Haskell said she and the other OMWC members enjoyed the opportunity to share ideas and become acquainted with the JSU women’s council members. 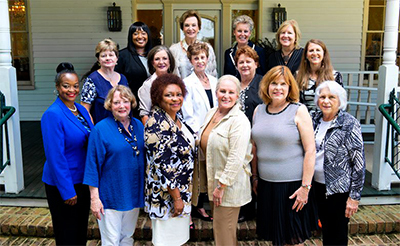 On Feb. 14, 2000, the Ole Miss Women’s Council began with a group of philanthropic minded women committed to providing endowed scholarships for its council scholars and guiding them into their future careers as well as helping with the development of life skills through the leadership-mentorship program. Seven years later, the Jackson State University Development Foundation Women’s Council for Philanthropy was officially established. Evangeline Robinson, now assistant professor of integrated marketing at Ole Miss, was instrumental in starting the JSU program when she worked there as the executive director of institutional advancement. Not long after a conversation with then JSU President Ronald Mason about increasing the number of JSU’s female donors, Robinson attended a conference during which then UM development officer Ellen Rolfes discussed the OMWC. “I immediately thought it was exactly what we needed at Jackson State to get more women involved. I introduced myself to Ellen and that started the conversation,” Robinson recalls, adding that Rolfes, who helped start the OMWC, Creekmore and Gloria Kellum, then Vice Chancellor for University Relations at Ole Miss, became faithful resources as she began to plan the JSU organization. “Our councils share an important bond, in that Meredith was inspired to share the mission of our council with this group of remarkable women, and so then served as a founding member of the JSUWC in 2007,” Haskell said. For more information on the Ole Miss Women’s Council, visit omwc.olemiss.edu and for information on the Jackson State University Development Foundation Women’s Council for Philanthropy, visit jsums.edu/wcphilanthropy.